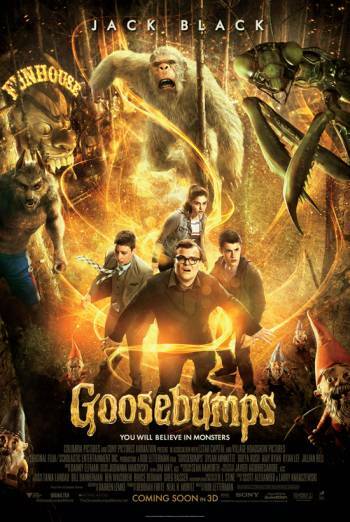 GOOSEBUMPS is an adventure horror about a boy who has to save his town when hundreds of monsters are unleashed from his neighbour's book collection. There are various evil characters such as a talking ventriloquist's dummy, a giant praying mantis, evil garden gnomes and a yeti. There are occasional jump moments and sight of characters screaming or running in fear from the evil characters. One scene shows an evil clown and other characters parading through the school halls as students run away screaming. There is a scene in which a pet poodle starts levitating and then snaps and snarls at a woman.